Among the many love stories I have seen, Never thought of picking up a story basing on Hero performance. It is AKBAR SALEEM ANARKALI (telugu). I was mesmerized from this story and started reading about it more. Collected my best for building an article on it. This story was originally written by Indian writer Abdul Halim Sharar and on the first page of that book he had clearly mentioned it to be a work of fiction. Anarkali a beautiful name from our history means pomegranate blossom was a legendary slave girl from Lahore(in present day Pakistan). Nevertheless, her story is cherished by many and has been adapted into literature, art and cinema. The Great Mughal emperor Akbar and his wife, Mariam-uz-Zamani, had a son named Prince Saleem (later Emperor Jahangir). He was a spoiled and rude boy and because of this, Akbar the Great sent his son away to the army for fourteen years to learn the discipline required to rule the empire. Finally, Akbar allowed this son to return to the main palace in Lahore. Since this day was one of great celebration, the harem of Akbar decided to hold a great Mujra (dance performance) by a beautiful girl named Nadeera, daughter of Noor Khan Argun. Since she was an exceptional beauty, "like a blossoming flower", Akbar called her Anarkali (blossoming pomegranate). During her first and famous Mujra in Lahore Prince Saleem fell in love with her and it later became apparent that she was also in love with him. Later, they both began to see each other although the matter was kept quiet. 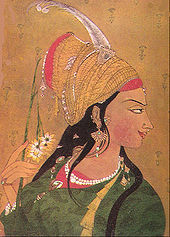 Later, however, Prince Saleem informed his father, Akbar, of his intention to marry Anarkali and make her the Empress. 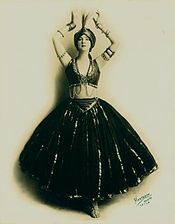 The problem was that Anarkali, despite her fame in Lahore, was a dancer and a maid and not of noble blood. So Akbar (who was sensitive about his own mother, Hamida Banu Begum, being a commoner) forbade Saleem from seeing Anarkali again. Prince Saleem and Akbar had an argument that later became very serious after Akbar ordered the arrest of Anarkali and placed her in one of the jail dungeons in Lahore. After many attempts, Saleem and one of his friends helped Anarkali escape and hid her near the outskirts of Lahore. Then, the furious Prince Saleem organised an army (from those loyal to him during his fourteen years there) and began an attack on the city; Akbar, being the emperor, had a much larger army and quickly defeated Prince Saleem's force. Akbar gave his son two choices: either to surrender Anarkali to them or to face the death penalty. Prince Saleem, out of his true love for Anarkali, chose the death penalty. Anarkali, however, unable to allow Prince Saleem to die, came out of hiding and approached the Mughal emperor, Akbar. She asked him if she could be the one to give up her life in order to save Prince Saleem, and after Akbar agreed, she asked for just one wish, which was to spend just one pleasant night with Prince Saleem. After her night with Saleem, Anarkali drugged Saleem with a pomegranate blossom. After a very tearful goodbye to the unconscious Saleem, she left the royal palace with guards. She was taken to the area near present-day Anarkali Bazaar in Lahore, where a large ditch was made for her. She was strapped to a board of wood and lowered in it by soldiers belonging to Akbar. They closed the top of the large ditch with a brick wall and buried her alive. A second version of the story says that the Emperor Akbar helped Anarkali escape from the ditch through a series of underground tunnels with her mother only with the promise of Anarkali to leave the Mughal empire and never return. Thus it is not known whether Anarkali survived or not. Another quite popular version states that she was immured alive in a wall. 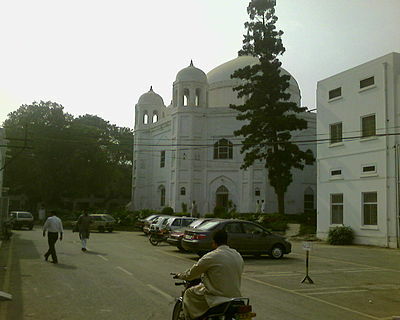 A tomb, thought to be that of Anarkali, is situated on the premises of the Punjab Civil Secretariat in Lahore, Pakistan and now houses the Punjab Records Office. Previously, it had been transformed into a Christian church by the British. A bazaar located nearby on The Mall Road is named Anarkali bazaar after Anarkali. It is one of the oldest surviving markets in Pakistan, dating back at least 200 years. The sarcophagus also bears two dates, given in both letters and in numerals: 1008 Hijri (AD 1599–1600) on the eastern side of the sarcophagus and 1024 Hijri (AD 1615–16) on the western side. Scholar Ahsan Quraishi mentions one more inscription in the tomb, that is said to have been destroyed by General Ventura, the French mercenary fighting for the Sikhs, who used the monument as his residence. The contents of this extinct Persian inscription can be translated as follows: "The innocent who is murdered mercilessly and who dies after enduring much pain is a martyr. God considers him/her a martyr." Although the name of Anarkali is not mentioned in any of these inscriptions but on the basis of the contents of these inscriptions, a group of scholars construe that the person buried in the memorial is no other than Anarkali. Of the two dates, the first is believed to be that of the execution of Anarkali and the second one as the date of the erection of the tomb. But this supposition cannot be correct because Akbar was not at Lahore in 1008 Hijri. He had already left it for Agra in 1007 (Hijri ) (in November 1598). So the story about Anarkali being buried alive by the orders of Akbar cannot be correct. Edward Terry who visited a few years after William Finch writes that Akbar had threatened to disinherit Jahangir, for his liaison with Anarkali, the emperor’s most beloved wife. But on his death-bed, Akbar repealed it.Basing his analysis on the above two Britishers’ accounts, Abraham Eraly, the author of The Last Spring: The Lives and Times of the Great Mughals, suspects that there "seems to have been an oedipal conflict between Akbar and Salim." He also considers it probable that the legendary Anarkali was nobody other than the mother of Prince Daniyal. Eraly supports his hypothesis by quoting an incident recorded by Abul Fazl, the court-historian of Akbar. According to the historian, Salim was beaten up one evening by guards of the royal harem of Akbar. The story is that a mad man had wandered into Akbar’s harem because of the carelessness of the guards. Abul Fazl writes that Salim caught the man but was himself mistaken for the intruder. The emperor arrived upon the scene and was about to strike with his sword when he recognised Salim. Most probably, the intruder was no other than Prince Salim and the story of the mad man was concocted to put a veil on the indecency of the Prince. Another scholar, Muhammad Baqir, the author of Lahore Past and Present opines that Anarkali was originally the name of the garden in which the tomb was situated, but with the passage of time, the tomb itself came to be named as that of Anarkali’s. This garden is mentioned by Dara Shikoh, the grandson of Jahangir, in his work Sakinat al-Auliya, as one of the places where the Saint Hazrat Mian Mir used to sit. Dara also mentions the existence of a tomb in the garden but he does not give it any name. Muhammad Baqir believes that the so-called tomb of Anarkali actually belongs to the lady named or entitled Sahib-i Jamal, another wife of Salim and the mother of the Prince’s second son Sultan Parvez, and a daughter of the noble Zain Khan Koka. This conclusion is also partially faulty. The mother of Sultan Parviz was not a daughter of Zain Khan Koka but the daughter of Khawaja Hasan, the paternal uncle of Zain Khan. Of course, subsequently, the daughter of Zain Khan was also married to Salim, on 18 June 1596.It is recorded in Akbar Nama that Jahangir "became violently enamoured of the daughter of Zain Khan Koka. H.M. (Akbar) was displeased at the impropriety, but he saw that his heart was immoderately affected, he, of necessity, gave his consent." The translator of Akbar Nama, H. Beveridge, opines that Akbar objected to the marriage, because the Prince was already married "to Zain Khan’s niece" (actually the daughter of paternal uncle of Zain Khan, and hence his sister). Akbar objected to marriages between near relations. But we do not know the date of death of the either of these two wives of Jahangir. Noted art-historian R. Nath argues that there is no wife of Jahangir on record bearing the name or title of Anarkali to whom the emperor could have built a tomb and dedicated a couplet with a suffix Majnun. He considers it "absolutely improbable that the grand Mughal emperor would address his married wife as yar designate himself as majnun and aspire to see her face once again. Had he not seen her enough? Obviously she was not his married wife but only his beloved, to whom he would take the liberty to be romantic and a little poetic too, and it appears to be a case of an unsuccessful romance of a disappointed lover.... The prince could not save her, though it is on record that he was so unhappy with his father in this year 1599 that he defied his orders and revolted. It may be recalled that Mehrunissa (later Nurjahan Begum) was also married to Sher Afgan the same year and the young Prince was so dejected and disturbed on the failure of his two romances and annihilation of his tender feelings of love that he went as far as to defy Akbar." Could I behold the face of my beloved once more, I would thank God until the day of resurrection. The tomb was converted into a church during British occupation and now the building serves as an archive (with a collection of old prints) within the compound of the Government Record Office. On the lower Mall Road, inside the grounds of Punjab Secretrariat lies the tomb of Anarkali. The tomb is accessible to the public. Anarkali(Pomegranate Blossom) was a legendary favourite in the harem of Emperor Akbar. Apparently she had an affair eith Akbar's son, Prince Salim. One day Akbar saw her return Salim's smile, and as punishment she was buried alive in 1599. When Salim became Emperor Jahangir, he built her a magnificiant tomb. The tomb,built in 1615 is a forerunner of the famous Taj Mahal : it is octangle, with a huge dome in the centre surrounded by eight octangle cupolas supported by columns. 2.The second view is that Anarkali after the death of Akbar was recalled by Salim(Jehangir) and they married and was given a new Identity of Nur Jehan. Nur Jehan was the daughter of a Persian immigrant, Mirza Ghiyas Baig of Tehran. Before becoming the beloved wife of the Mughal emperor Jehangir, she was the widow of a Mughal officer, Sher Afghan Quli Khan. Mehr-un-Nisa, entitled Nur Jehan, was born when her parents were migrating to the Sub-continent in the 16th century. She received her early education in Quran and the Persian language and had a special flair for poetry. Her father came to the Sub-continent during the time of the Mughal emperor, Akbar, and entered into his service. He rose rapidly by sheer merit. In 1607, Nur Jehan was brought to the court as royal ward. She was beautiful and highly intelligent and attracted Jehangir's attention. A good deal of fiction has gathered round this remarkable woman, obscuring her personality and role in the social and political life of this period. It is wrongly and widely believed that Jehangir murdered Sher Afghan, Nur Jehan's first husband, because he wanted to marry Nur Jehan. In actuality, he died in a skirmish in 1607. The conqueror of the world, Jehangir fell in love with Nur Jehan and married her in 1611. He gave her the title of Nur Mehal, "Light of the Palace" and later Nur Jehan, "Light of the World". After marriage, Nur Jehan won Jehangir's complete confidence. She carefully attended to the affairs of the state. Her father and brother became ministers and together they dominated the courts. A number of historians believe that Nur Jehan became the real power behind the throne and practically the sovereign of the Mughal Empire. For many years she wielded the imperial powers. She even gave audiences at her palace and her name was placed on the coinage. Nur Jehan influenced a large number of brilliant soldiers, scholars and poets from Iran, who subsequently played an important role in the administration and in the development of the cultural life of Mughal Empire. The decision to marry her daughter from her first husband, to Shah Jehan's younger brother Shahryar, and her consequent support to his candidature to the throne caused Shah Jehan's rebellion. Emperor Jehangir was captured by rebels in 1626 while he was on his way to Kashmir. Nur Jehan intervened to get her husband released. Jehangir was rescued but died on 28 October 1627. Nur Jehan had a magnificent tomb erected over the grave of her husband. She retired from the world and lived a quiet and lonely life for 16 years after the death of Jehangir. She died in 1643, and is buried besides Jehangir at Shahdra, Lahore. There is no authentic proof that the story of Anarkali is true.